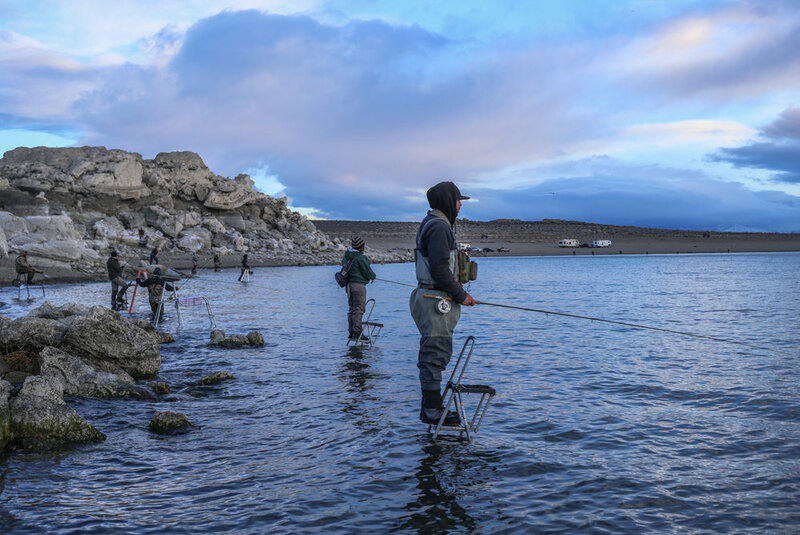 Many fisherman use ladder chairs to fish here at Pyramid Lake. Most are built with heavy metals so that they stay sturdy with the large waves crashing. These allow for a relaxing day on the water, especially for indicator fishing in the spring time. Float tubes are a great way to fish Pyramid Lake in the early season. These allow you to float out to the deeper sections and shelves at the lake and get down to the larger pods of fish. Many gear fisherman and fly-fisherman are successful using this tactic. Just like many other lakes in America, shore fishing can be very popular at Pyramid Lake. Although, not at every lake can you catch a huge trout from shore! Shore fishing is very effective once winter hits throughout the spring time. Trolling from the boat can be very effective here at Pyramid Lake. This allows you to cover a large span of water and fishing deep while doing so. A plethora of the large fish caught at Pyramid are picked up by trolling fisherman. When the fishing gets slow, you know where to go!